I wondered what the likelihood was of an expert sleepers storage strip? Seems like Macro Machines are out of the game, leaving a gap in the market for a small footprint hp alternative (ideally with a mungo-style zoom switch). I'm sure there are many who would jump to purchase such a thing to accompany a disting. I know I would. What does the 'zoom switch' do? Increases the resolution of a module’s pots for fine-tuning purposes. On modules that are designed to do this, of course. OK, final thought that would smash this out of the park... The original storage strip would only reliably work with upto 3 modules. It would be unbelievable if a new alternative could work with 5+ modules. Instant recall for a quintet of distings & mungo's would be just amazing. Final suggestion relating to this, what about a new mode on Disting enabling it to function as a Storage strip by saving the settings of other distings / compatible select bus modules (mungo etc)? Ideally using the Z knob for zoom functionality. I know it’s in some ways treading on the toes of the midi expander but it would serve for those with no desire for midi etc, and add to the already compelling case for requiring multiple distings. The disting can't send on the select bus, only receive. But I suppose we could use the disting's MIDI output to drive the select bus breakout. Just poking my head back in to think about this. Having checked the documentation, I can't say with clarity whether this functionality already exists or if this is something you would consider adding Os? How would you use the disting / select bus breakout to create a saved bus state and could there be a way to cycle through multiple saved 'preset' states. To be able to cycle using CV would be masterful. - CC #16 is used to determine whether it's a save or recall. It's a recall unless CC #16 has been sent with value 127. So those are the messages you want to send, under CV control if you desire. Thanks for that, do you know if there's a limit to the number of modules you can send a message to on the bus? Just came here to +1 the need for a module that has the functionality of the storage strip. I was about to create a new post when I found this one. I am in the same boat and would buy an ES module that could store/recall multiple Distings. 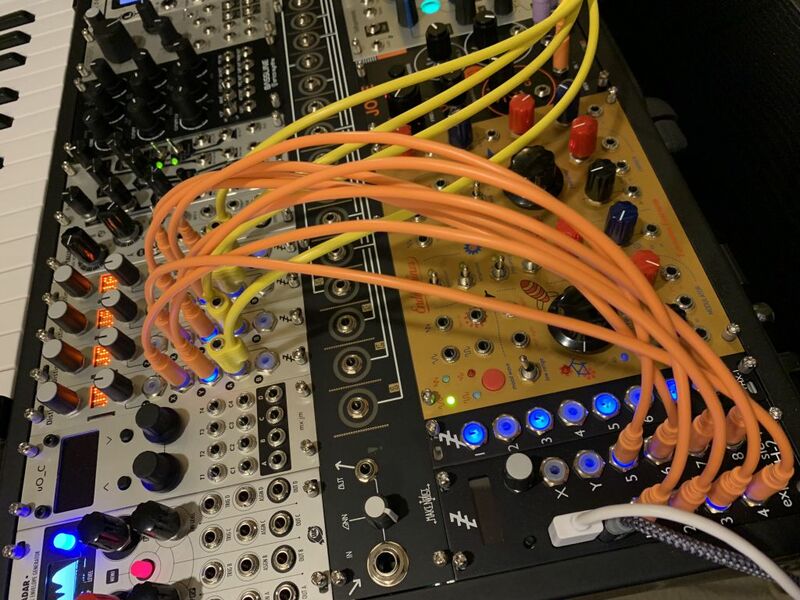 Currently I have an FH-2+FHX-1 and four Disting Mk4s - the main purpose of that combination is for polyphony and at present I have to set each Disting to the same setting when I want to change "patches" with the J6 algorithm - not the end of the world except I also have to adjust envelope settings for each one so seamless patch switching really isn't possible (or at least I haven't figured out a way to do this quickly). Add midi ports to each Disting. I just got the socket cables and soldered them to the pins. Set each Disting to separate consecutive midi channels, then just send CC to each to change algorithms, samples, settings, whatever. It can all happen a LOT faster than changing things up manually. Or use the Select Bus breakout to send MIDI to all the distings at once. You could send that from your DAW, or from the FH-2 (via the FH-2's breakout). Is the Select Bus breakout a separate unit that connects via...? It's in the René mk2 user manual on the Make Noise site. Any news on this? I'd also be very interested in a module with Storage Strip functionality!